"The Moon in the midst of a clear sky became suddenly eclipsed; the soldiers who were ignorant of the cause took this for an omen referring to their present adventures: to their labors they compared the eclipse of the planet, and prophesied 'that if to the distressed goodness should be restored her wonted brightness and splendor, equally successful would be the issue of their struggle.' Hence they made a loud noise, by ringing upon brazen metal, and by blowing trumpets and cornets; as she appeared brighter or darker they exulted or lamented." According to the evangelists, Jesus was crucified on a Friday afternoon, some hours prior to the beginning of the Jewish Sabbath. It is recorded that Jesus was crucified during the period when Pontius Pilate was procurator of Judea (26-36 CE). However, there is no consensus on the date of the crucifixion. Evidence suggests April 3, 33 CE, while others suggest it was April 7, 30 CE. There are various allusions in the Bible to the Moon being dark and turned to blood when it rose in the evening after the crucifixion, which sounds like a lunar eclipse. 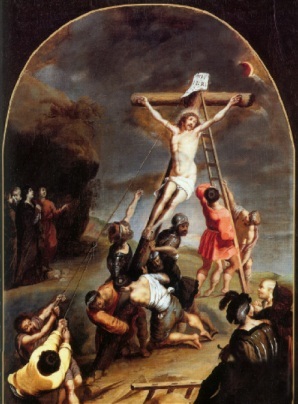 The crucifixion eclipse. According to the evangelists, the sun darkened during the crucifixion of Christ. Later, the event was associated with an eclipse that was visible at Jerusalem. Credit: © Valenciennes, Musee des Beaux Arts, photo R.G. Ojeda. "Jesus was delivered to him by Herod, Archelaus, Philip, Annas, Caiphas, and all the people. At his crucifixion the Sun was darkened; the stars appeared and in all the world people lighted lamps from the sixth hour till evening; the Moon appeared like blood." This may be the result of a dust storm caused by the khamsin, a hot wind from the south. Under such circumstances - a lunar eclipse while there is much suspended dust - one would expect the Moon to appear the dark crimson of blood. The reason why the Moon is blood red is that, although it is geometrically in the Earth's shadow, sunlight is refracted through the Earth's upper atmosphere, where normal scattering will prevent blue light from penetrating. But this refracted light would be much weaker than direct light from even a small portion of the Sun and the blood colour associated with the eclipse would not be visible to the unaided eye. However, the Moon would have an amber colour from atmospheric absorption, similar to any other occasion when the Moon is low in the horizon. "In the fourth year of the 202nd Olympiad, there was an eclipse of the Sun which was greater than any known before and in the sixth hour of the day it became night; so that stars appeared in the heaven; and a great Earthquake that broke out in Bithynia destroyed the greatest part of Nicaea." In fact, mention is also made in the Bible of the Sun being darkened earlier that day: "The Sun shall be turned into darkness." There is controversy among researchers whether this was a solar or a lunar eclipse, and also controversy about the date. In any case, an eclipse occurring in the very same night of the crucifixion would have been seen by believers as a supernatural sign and influenced the change of mind of the Jews and Pilate towards the body of Christ, leading to the placing of a military guard on the tomb.